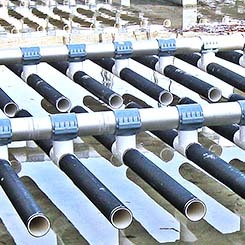 DDI SuperFlex Aeration Diffusers - Dorian Drake International Inc.
Dorian Drake International is pleased to present it’s DDI SuperFlex line of aeration diffusers, membrane diffusers, and specialty diffusers for new and existing municipal and industrial aeration applications. Our goal is to supply quality products and service at competitive pricing. Our diffusers service all major brands. 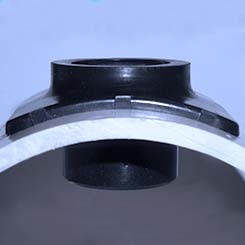 Threaded Flexible Membrane Fine Bubble Disc Diffuser. SuperFlex disc diffuser units are available with premium quality EPDM membranes. The Tube type diffuser unit is a fine pore, flexible membrane diffuser capable of providing a high level of oxygen transfer efficiency with maximum mixing flexibility. DDI SuperFlex Diffusers Mounts are 3 times stronger than conventional mounting or push-on systems. Headquartered in White Plains, New York USA, Dorian Drake International has been exporting high-quality USA-made products since 1946. 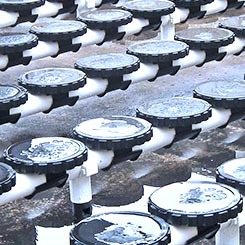 With proven expertise and experience, Dorian Drake has assembled a best-in-class series of fine bubble disc and tube diffusers under the DDI SuperFlex brand that meets all US standards and specifications suitable for installation in new and existing municipal and industrial aeration applications. Looking for market-leading Municipal & Industrial Aeration Applications? Contact Dorian Drake International. Catalog available in English, Spanish, and Chinese. Dorian Drake International is an innovative export management company, providing manufacturers with a full-service alternative to staffing and managing their own export department.